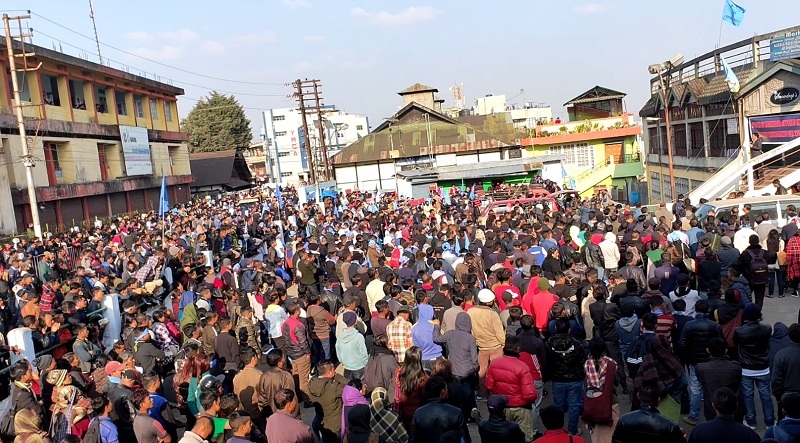 In an unprecedented move, a minister and a legislator of the Meghalaya Democratic Alliance (MDA) government joined the public rally where thousands of people came out in protest against the Citizenship Amendment Bill, 2016 in Shillong on Wednesday. Protestors at the rally vowed to intensify their stir if the contentious Bill is passed in the Rajya Sabha. The protest was organized at Motphran on Wednesday by the influential Khasi Students Union (KSU) where Urban Affairs Minister, Hamletson Dohling and State Planning Board Chairman, Lambor Malngiang also took part. The rally was christened ‘People of Meghalaya opposes the Citizenship (Amendment) Bill, 2016’. Dohling and Malngiang also addressed the rally, according to reports. According to Dohling, the north-eastern states will burn if this bill becomes an Act. Dohling also informed that the government has targeted to start the construction of entry-exit points in Ri Bhoi district by April. Malngiang termed the Bill a vote bank politics of the BJP adding that the citizenship bill is ‘a taxi that will ferry immigrants from Bangladesh to Meghalaya and the north-eastern region’. KSU president, Lambokstarwell Marngar and NESO chairman, Samuel B Jyrwa also warned of a battle if the citizenship bill is passed in Rajya Sabha. Jyrwa also urged the indigenous people of Meghalaya to stand united against the Bill because this is the Bill that will jeopardize the identity of indigenous people.